Community Cloud sets a new standard for online community platforms. It re-imagines every customer touch point — from sales and marketing through service and distribution — as an opportunity to build a frictionless customer experience. Engagement never stops. 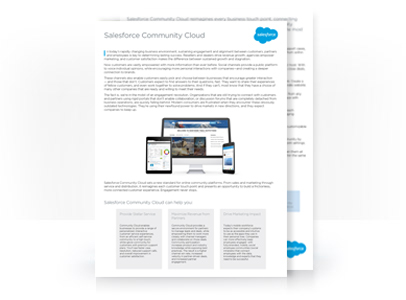 See how Community Cloud sets a new standard for online community platforms.